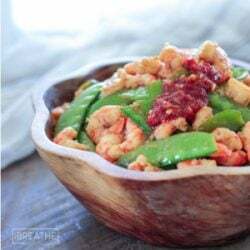 This delicious low carb shrimp & snow peas recipe is so good you’ll never miss the takeout version! You can also substitute chicken, beef or pork! Keto & Paleo friendly. Heat the coconut oil and sesame oil in a large skillet. Add the ginger and garlic and cook about 2 minutes or until fragrant and softened. Add the snow peas and cook for 1 minute. Stir in the gluten free soy sauce, sweetener and lime juice until combined. Add the shrimp and cook for 2 – 3 minutes or until pink and opaque. Stir in the Sambal Oelek (or any garlic chili paste) and remove from heat. Serve hot over cauliflower rice, shiritake noodles or even zucchini noodles if you prefer. Nutrition info does not include cauliflower rice or extra condiments.